I made these tins for my Bible study friends last year. I filled them with gum and mints. I got these tins from Walmart. They were gift card holders in shades of pink and blue for babies! I used the Stamped cartridge from Cricut. I love these $1 mailboxes from Target. They come in red, white, and pink and are such fun to alter. I filled them with Starbuck's gift cards, gum & lipgloss. I made this paint can to take to a Cricut Swarm in two weeks. I am going to fill it with scrapping goodies. Now I just need to get to work on the pictures I want to scrap at the Swarm. My sister gets to go with me to this one - I'm so excited!!! I made this card for my niece, Sarah, who loves all things black and green. She has never been a "girly girl," and it is fun to make things for her that are more her style. I got the idea from Dawn's Stampin Thoughts blog. Here is my other passion - cross stitch. The colors on this Santa are so pretty! This is using both floss and beads. I just love the 3D detail of his beard! Here is my July page! I LOVE the Cricut cart Paper Dolls Dress Up. I found this idea from a lady on the Cricut MB to make this Uncle Sam. I wish I could remember her name! Don't you find that crafters are so wonderful to share their ideas! I love to see other's work. Here is the calendar page for June. It is a birthday theme, as my daughter's birthday is in June. I used Stickles (of course) for the letters and the cupcake. I used Doodlecharms to make the cupcake. Here is my May CD calendar page. I used the Cricut Storybook cart for the flower. I put Aleene's Paper Glaze on the flower. It is a very pretty effect. Here is close up of the flower. I love the color combination of pink and brown. I originally bought this paper to do a "FAITH" mini book. Here is my lovely March calendar. I wanted to put a shamrock on this. I looked and looked for a shamrock in one of my MANY Cricut carts and could not find one! Finally, I thought to look through my old Creative Memories die cuts and found one. It was a little big, but it worked! I got this link from this FABULOUS blog called "Just a scrappin." This blog is linked. You should check it out! Here is my February CD case. I used the "Figgy Pudding" papers from Basic Grey on many of the calendar pages. I absolutely love, love this paper. Of course, the fact that the majority of it is RED probably doesn't hurt! I used Stickles on "February." I used Aleene's Paper Glaze on the "love." It makes the paper look very shiny! Cool effect. I made this sign for a church activity using Cricut's Beyond Birthdays cartridge and tons of stickles. I got this idea from The Pink Stamper's blog. I think these are the most powerful words ever written. God sent Jesus to die for us. We certainly don’t deserve it, and we will never be worthy, but we are covered by God’s grace anyway. What do you have to do to receive this grace? It’s simple – you have to ask God to wipe away your sins and accept Jesus as your savior. I love this song by Chris Tomlin. It is called “Indescribable.” One of the lines at the end says, “You see the depths of my heart, and You love me the same.” He is not waiting for us to be perfect – Praise God – He wants us where we are now! Happy Birthday sweetheart! You are the best husband in the world. I have been working on a CD calendar. I love the idea of re-using items that would otherwise be thrown away. This calendar uses an empty CD case as the base. I am really enjoying creating the calendar pages. It is a way to use up scraps, and since the project is fairly small, there is a real sense of accomplishment in finishing something! I wish the TONS of Stickles that I used would show up better in the picture. The little calendar itself came from a lady on the Cricut MB. This was my project for today. 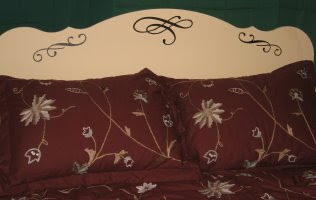 I got this headboard at the thrift store for $10. I used leftover wall paint. It looked fine, but very boring. I decided to use my new Cricut cartridge, Home Decor, and Wall Pops vinyl to dress it up a bit! This is the first post to my new blog. I look forward to sharing my faith, my thoughts, and my creations. Happy New Year! !